2015 marks 800 years of history of the longest, oldest and most popular procession in the world – The Lord Mayor’s Show. The vibrant spectacle is a combination of a very modern carnival with mediaeval pageantry showcasing the City of London as the world leader in international finance and business services. This colourful, fun event attracts crowds of more than half a million lining the route around the City. BBC TV broadcasts the event for 90 minutes to a wider audience of many millions more. Social media and iPhone /Android Apps increase the exposure of the event even further. The procession of more than 20 military and civilian bands will be headed by World Trader Liveryman, The Lord Mayor, Lord Mountevans, the Rt.Hon Jeffrey Evans. This is the official title for the head of the City of London Corporation, where The Lord Mayor presides over governing bodies, the Court of Aldermen, and the Court of Common Council. Outside the City The Lord Mayor takes precedence with, but after, members of the Cabinets. On behalf of the Sovereign and the Government The Lord Mayor regularly acts as host for hospitality provided by the City of London Corporation for visiting heads of state and foreign dignitaries. 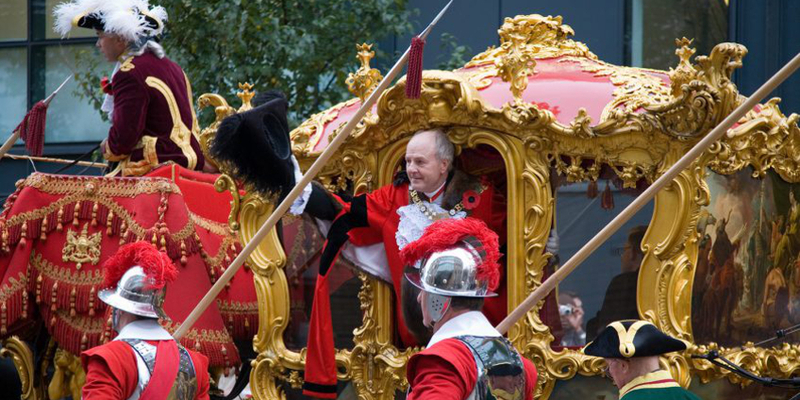 At the Lord Mayor’s Show, The Lord Mayor will be driven in the Gold State Coach flanked by ceremonial Pike men dressed in armour breastplates and bright red tunics. The historic purpose of the event is to convey him from his ‘home ‘at Mansion House to the Royal Courts of Justice to swear an oath of allegiance to the Sovereign. But behind the entire historic spectacle it is business that takes centre stage. The Lord Mayor takes on the role, for one year, as a dedicated ambassador. During his term in office he supports and promotes the City of London on a global stage – leading delegations of senior business representatives to meet those at the highest levels of government and industry in overseas countries. A domestic programme also keeps the Lord Mayor in touch with regional economic activity and promotes the contribution the City can make in these areas. The Worshipful Company of World Traders Livery with its historic links to 11th Century Guilds, is participating in the Show as one of the 70 display ‘floats’ – or in our case, an open top vintage bus. As the company name suggests, our selected membership is made up of professionals who work and promote world trade. But it is our Business Sponsors who have supported this event linked to The Lord Mayor’s Charitable Causes which has made the World Traders’ Livery Company participation in this national spectacle, possible. This year’s event has at its’ core, corporate governance, good citizenship, diversity and philanthropy. The Lord Mayor has chosen three main themes for his year in office – an umbrella theme of Innovation & Skills, Maritime Power, and the UK as a haven of Philanthropy. In support of the annual Lord Mayor’s Appeal The Lord Mayor has selected two charities to raise funds and give direct support – Junior Diabetes and The Sea Cadets – causes which impact on many people’s lives. That is why the Worshipful Company of World Traders Livery – whose mandate lies in fellowship, education and charitable giving – is partnering business and charities in this historic event. With more than 300 staff across its offices worldwide, ICAP Energy is the energy-focused commodity arm of ICAP, providing coverage on base and precious metals, emission credits, crude oil and oil products, electricity and natural gas, coal, freight and weather derivatives. ICAP Energy is a leading energy broker with operations in London, Amsterdam, Bergen, Singapore, Sydney and seven centres in North America. The company is consistently names Broker of the Year by Energy RISK magazine in its annual poll of market participants. BABCOCK International Group’s work in Support Services is responsible for the delivery of many of the critical services on which our everyday life depends. Our work is usually behind the scenes supporting customers in complex and critical environments. We work in partnership with energy companies, local authorities, schools and colleges, airports, emergency services, construction companies and many other large organisations. 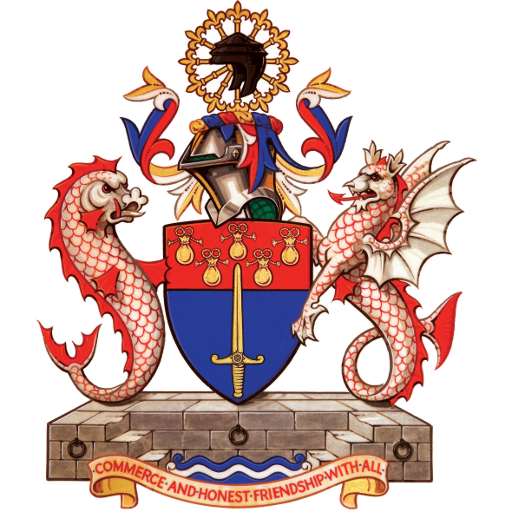 We have a diverse portfolio of business interests complementary to the range of professions and backgrounds which make up the membership of The Worshipful Company of World Traders. Our support helps Babcock take part in the international business community exchange of thoughts and ideas about issues affecting world trade. DX is a leading independent mail, parcels and logistics end to end network operator in the UK and Ireland (Eire) established in 1975, delivering approximately 200 million items in 2014. DX provides proven next day delivery services for mail, parcels and 2-Man deliveries to businesses and residential addresses nationwide, for both public and private sector companies. In particular, DX specialises in next day or scheduled delivery of time critical, mission critical and high value items for B2B and B2C customers. One of the City’s most established private members clubs. The Club’s management provided the most central and prestigious facilities for our overseas guests and Participants in the World Traders’ Livery Company open top vintage bus float in The Lord Mayor’s Show. It is also providing a wonderful lunch venue for our Sponsors’ following this memorable 800th anniversary of The Lord Mayor’s Show. For his continuous support of The World Traders’ Livery Company and his interest in The City of London and World Trade. For generously providing the use of the open top vintage bus to commemorate and support T Lord Mountevans,The Rt. Hon Jeffrey Evans – himself a leading member of the World Traders’ Livery Company. A liveryman of the World Traders’ Livery Company who engages in many business facets of the Company’s activities to ensure the effective delivery of strategic development projects.